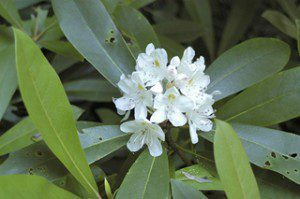 Wild and wonderful West Virginia is calling you to visit some special places June 22-28, when we hope to see Rhododendron maximum, the state flower of West Virginia, making quite a show. We’ll meet after dinner Sunday evening at Elk River Inn in Slatyfork, West Virginia, where we’ll spend two nights. While in the area, among the destinations we’ll visit are the Cranberry Glades Botanical Area, the largest expanse of bogs in the state, and the Highland Scenic Highway with its diverse roadside habitats and beautiful vistas of the surrounding mountains and valleys. complex. Also not to be missed is Dolly Sods, the highest plateau of its type east of the Mississippi River. Heath barrens, grass balds, sphagnum glades and hardwood and spruce forests are all a part of what makes this area one of enduring interest to botanists. Please reserve your space on this field trip no later than March 15 as deposits are required to reserve rooms. Included with your paymenr will be six night’s lodging, double occupancy, six breakfasts and five lunches. VNPS members will pay $700, $300 of which is due March 15. Please note that $25 to $75 may be nonrefundable after that date depending on when you cancel and whether we can fill your space.